University Of Oxford, one of the two greatest seats of learning in Great Britain. The city of Oxford, as the scene of important military and political events, is mentioned from the time of Alfred down, but the first indisputable witness to its being a seat of learning is Giraldus Cambrensis, about 1180. It is certain, however, that Vacarius, a Lombard from the university of Bologna, lectured on the civil law at Oxford about 1149, and a foreigner would hardly have selected that city for such a purpose unless it was already frequented by students. The history of the university prior to the time of King John (1199) is almost wholly conjectural; but the following facts have been established. Monasteries and other religious houses existed at Oxford long anterior to any special mention of it as a seat of learning. Attached to many of these were schools which gave gratuitous instruction, and usually support, to those who were preparing for the service of the church; and secular schools sprang up in imitation of the cloistral institutions. Common interests induced the teachers to form a voluntary association for the discussion and decision of questions of general concern. They chose one of their number to preside over them, and as the powers and duties of the association increased, subordinate offices were created. This association, distinct from and of higher authority than any particular school, was the origin of the university of Oxford. The date of its formation and the phases of its development are unknown; it had become a great and flourishing institution long before it was mentioned in any known royal decree or legislative enactment. The first known application to it of the word university (universitas) occurs in a statute of the third year of King John (1201); while the earliest known document in which that word is applied to the schools at Paris is an ordinance of Pope Innocent III. dated 1215. At that time, it is said, about 3,000 students were connected with its schools. In 1209 a student accidentally killed a woman belonging to the town, and fearing the consequences fled the place, and three innocent students were seized and hanged. All the scholars of the university quitted Oxford in a body, and they also obtained from the pope an interdict against the town and all persons who should resort to it for the purpose of study. The dispute was finally adjusted, the citizens obtained absolution, and King John conferred upon the university certain privileges, the principal of which was the right to take cognizance of all causes in which a student or the servant of a student was a party. Henry III. favored the university, and the number of students was greater than during any previous or subsequent reign. Anthony a Wood, the principal authority for its history, says that at one time there were in Oxford 30,000 persons claiming to be scholars, though many of these did not really belong to the university; but this is undoubtedly an enormous exaggeration. The first charter recognizing the university as a corporate body, and conferring additional privileges upon it, was granted by Henry III. in 1244. This was followed by others from him and his successors confirming the old or granting new privileges. Although the prosperity of the town depended almost entirely upon the university, intense hostility existed between the citizens and the scholars. As the latter were all required to wear a gown, the feuds which often broke out in riots between them and the citizens were called quarrels between "town and gown." On St. Scholastica's day, Feb. 10, 1355, a disturbance occurred in which several lives were lost, and the town was laid under an interdict by the bishop of Lincoln, whose diocese then included Oxford. It was released two years afterward on condition that the commonalty should thereafter annually celebrate in St. Mary's church a service for the souls of those killed, and that the mayor, two bailiffs, and 00 of the principal citizens should personally appear in the church at mass and offer a penny each at the great altar; in default of which they bound themselves to pay 100 marks yearly to the university. Subsequently the penance was repeatedly mitigated, but it was not wholly remitted till 1825. The religious troubles of the reign of Henry VIII. diminished the inducements to the study of theology, and from this and other causes the number of students at Oxford greatly declined. In 154G only 13 degrees were conferred, and in 1552 the number of students on the books was only 1,015, and of these the larger majority had quitted the university. An elaborate act of parliament "concerning the incorporations of the universities of Oxford and Cambridge," sanctioned by Elizabeth in 1570, resumed and defined previous charters; and from that time until the passage of the act of 1854 this was regarded by both universities as the chief source of their powers and privileges. In 1G03 James I. granted the privilege, which still continues, of electing two representatives to parliament; they are styled burgesses. By an act of parliament passed in the third year of his reign, Catholics were disabled from "presenting to any ecclesiastical benefice or nominating to any free school, hospital, or donative;" and their rights of presentation and nomination were made over in about equal portions to the two universities. The university of Oxford was distinguished for its loyalty to the Stuarts, and it melted down its plate to assist Charles I. in his struggle with the parliament. This provoked the hostility of the nonconformists, and during their supremacy the university was plundered, and many of its professors and masters were expelled and its scholars forced to leave. The statutes of the university were codified in 1G29 by Archbishop Laud, who was elected chancellor in 1630. His code was adopted by the university and ratified by the king in 1635, and was not essentially changed until the act of 1854. By the latter and subsequent acts considerable changes were made in the organization of the university and the colleges. The greater number of the fellowships and scholarships had been subjected by their founders to conditions which in time had become impracticable or absurd, and they were altered or abolished by the act of 1854. One of the most important of these changes was the throwing open to general competition of a large number of fellowships and scholarships which had before been restricted to particular classes of persons; and in many cases, where the original restrictions were retained, it was provided that they should be open to general competition in case no duly qualified candidates presented themselves. - The following account of the constitution of the university, the colleges, and other institutions connected with it, represents it as it exists at the present time. The official title of the university as a corporate body, " The Chancellor, Masters, and Scholars of the University of Oxford," has existed for centuries, and was confirmed by act of parliament in the reign of Elizabeth. The powers of the university are vested in four bodies. The "House of Congregation" consists of regents. Formerly every graduate acquired the right to teach, and incurred the obligation of doing so, if necessary, for a certain limited time. Those who voluntarily entered upon the office of teacher were called regentes ad placitum or voluntary regents; those who were under obligation to teach, if the number of voluntary regents was not sufficient, were said to be necessario regentes. The original meaning of these terms has become obsolete, but they are now used as follows: all doctors and masters of arts for two years from the end of the term in which they were admitted to their degrees are necessario regentes; all professors, doctors resident in the university, heads of colleges and halls, masters of the schools, censors and deans of colleges, are regentes ad placitum. The business of the house of congregation is confined to the ratification of the nomination of examiners and to the granting of ordinary degrees. The "House of Convocation" consists of all who are or have been regents, provided their names have constantly been kept on the books of some college or hall or of the dele'-gates of unattached students, and they have paid all statutable fees. All the formal business of the university as a corporate body, except what belongs to the house of congregation, is transacted in the house of convocation. It confers honorary degrees and others granted out of the usual course; and nearly nil offices in the gift of the university are filled by it. All questions are decided by the majority of votes, except that the chancellor or vice chancellor or his deputy singly, and the two proctors jointly, have a right of veto in all matters except elections; but practically the right is never exercised. No statute is binding until it has received the assent of convocation. The "Congregation of the University of Oxford " consists of the chancellor, the heads* of colleges and halls, the canons of Christ Church college, the proctors, members of the hebdomadal council, professors, examiners, and several other officials, and of all those members of convocation who resided within one mile and a half of Carfax during the year which ended on the first day of the preceding September. Carfax is the name given to a place where four streets meet, about the centre of the town. The passing of 140 nights within the prescribed limits is considered a sufficient compliance with the requirement. The chief business of the congregation is legislative. In it new statutes proposed by the hebdomadal council are promulgated, discussed, and amended. Every question is decided by a majority, and no right of veto exists. A statute approved by congregation goes, after an interval of seven days, to convocation for final adoption or rejection. The " Hebdomadal Council " consists of official and elected members. The official members are the chancellor, vice chancellor, late vice chancellor (for one year after he has ceased to hold office, or until the next triennial election), and the two proctors. The elected members are six heads of colleges or halls, six professors (who may also be heads of houses), and six members of convocation of not less than five years' standing (who may be heads of houses or professors). They are elected by the congregation of the university in such a way that one half of each of the three classes vacate their seats every three years, being however reëligible. This council has the initiative of all the legislation of the university. The highest officer of the university is the chancellor, who is elected for life by the house of convocation, and receives no pay. Formerly a resident ecclesiastic was always chosen, but for more than 200 years the office has been conferred upon noblemen who have been members of the university. The present chancellor (1875) is the marquis of Salisbury, formerly fellow of All Souls college. Except on rare occasions the duties of the office are discharged by the vice chancellor, who is annually nominated by the chancellor from the heads of colleges, and must be approved by convocation. The office is generally held by nomination for four years. The vice chancellor appoints from the heads of colleges four pro-vice-chancellors to serve in case of his absence. The office of senescchallus, or high steward, is now merely honorary, and the pay nominal. It is at present held by the earl of Carnarvon. There are two proctors, elected annually from the colleges and halls, and they each appoint two deputies. They are the chief police officers of the university, and have a large police jurisdiction in the town. There are numerous other officers. There are eight regius professorships (so called because founded by sovereigns of England), as follows: of divinity, civil law, medicine, Hebrew, and Creek, founded by Henry VIII. ; of modern history, by George I.; and of pastoral theology and of ecclesiastical history, by Victoria. Those founded by individuals after whom they are named, and otherwise, with their dates, are as follows: Margaret professorship of divinity, 1502; Savilian of geometry and of astronomy, 1619; Sedleian of natural philosophy, and Whyte's of moral philosophy, 1621; Camden of ancient history, 1622; Tomlins of anatomy, 1624, annexed in 1858 to the Linacre of physiology; of music, 1626; of botany, 1633; Laudian of Arabic, 1636; of poetry, 1708; the lord almoner's of Arabic, date unknown; of experimental philosophy, 1749; Vinerian of English law, 1758; clinical, 1780; Rawlinso-nian of Anglo-Saxon, 1795; Aldrichian of anatomy, of the practice of medicine, and of chemistry, 1803, of which the first was annexed in 1858 to the Linacre of physiology, the second to the regius of medicine, and the third was suppressed in 1866, when the Wayn-flete of chemistry was established at Magdalen college; of mineralogy, 1813; of geology, 1818; of political economy, 1825; Boden of Sanskrit, 1830; of logic; of the exegesis of Holy Scripture, 1847; Corpus of Latin literature, Chichele's of international law and diplomacy and of modern history, Waynflete of moral and metaphysical philosophy and of chemistry, and Linacre of physiology, all in 1854; Hope of zoology, 1861; of comparative philology, 1868; Corpus of jurisprudence, and Slade of fine art, 1869; and Ford of English history, 1870. The pay of the professors is from £50 to £900 a year, averaging about £380. The majority of the professors have heretofore taken little part in practical teaching. Except in a few merely formal cases, attendance upon their lectures is not compulsory; and they have employed their time in such literary or artistic pursuits as their tastes dictated. Besides these professors, there are a choragus, or master of musical praxis; demonstrators of experimental philosophy, chemistry, and anatomy; readers of English law and ancient history; lecturers on the Septuagint; teacherships of modern languages; and teachers of Hindostani and of Indian law and history. There are 37 scholarships, most of which are bestowed for proficiency in some particular branch of study; some are only open to those who have passed all examinations for the degree of B. A., and other conditions differ in each case. Most of them are tenable for three years, have an average annual income of about £60, and are open to general competition. There is one exhibition tenable for one year, with an income of £25. There are 18 prizes, but not all of them offered for competition every year. Many of them can be competed for only by those who have received the degree of B. A. Their average value is about £30. - The following named buildings and institutions belong to the university. The Bodleian library, founded by Sir Thomas Bodley, opened in 1602, is one of the great libraries of the world. (See Bodleian Library.) Connected with it is a reading room called the Camera Bodlciana, which contains all the newest works and the great Hope collection Of engraved portraits. The Clarendon press building was completed in 1830. All the printing of the university, and of the works of private authors the publication of which the university sees fit to undertake, is done here. Books printed for the university have the words E Typographeo Clarendoniano, or "At the Clarendon Press," in the imprint. The theatre, founded by Gilbert Sheldon, archbishop of Canterbury and chancellor of the university, was opened in 1669. The Ashmolean museum was erected by the university (1679-83) for the reception of the collection of natural and artificial curiosities presented by Elias Ashmole; it also contains a museum of antiquities and the Arundel marbles. The Clarendon building (formerly the Clarendon press building), so called because its cost was partly defrayed from the copyright on Lord Clarendons "History of the Rebellion," which was presented to the university, is the seat of its general business. It contains the delegates' room, police room, and various other offices. The Radcliffe observatory, erected with funds bequeathed by Dr. Radcliffe, is well furnished, and observations are regularly made. The Taylor institution, for the encouragement of the study of modern European languages, was erected in 1848 from a bequest of Sir Robert Taylor, and forms one building with that next mentioned. It contains a library and a reading room, in which may be found most of the leading periodicals of the continent. Its curators also have charge of a bequest of W. T. Horner, earl of Ilchester, for the encouragement of the study of the languages, literature, and history of the Slavic nations. The university galleries, containing works of art, were opened in 1845. The university museum, begun in 1855, is intended to promote the study of natural science. It contains lecture rooms, a spacious library and reading room, work rooms, laboratories, experimental apparatus, and all other facilities for investigating the phenomena of nature. This building also now contains the Radcliffe library. The botanic garden of about five acres was founded in 1632. The convocation house is used for the general business of convocation and for conferring degrees. The "divinity school" and "the schools " are no longer used for the purposes of instruction, but for conferring degrees in divinity, for public examinations, and other purposes. - Besides these institutions directly under the control of the university as a corporate body, there is a much larger number called colleges and halls, each with a separate government, but organically connected with the university. Previous to the middle of the 13th century the students at Oxford resided in the town in such places as their circumstances dictated. Sometimes several students would associate themselves, hire a building, choose some graduate of the higher degrees as their principal or guardian, and live in common. Their houses were variously called inns, hostels, or halls. The number of these halls is said to have at one time exceeded 300. Individuals at different times purchased or constructed buildings for the exclusive use of students, and appropriated funds for the maintenance of a limited number, who were called socii or fellows. They were students who had already received a degree from the university, and had a head, variously called warden, master, rector, etc., usually elected by themselves. To them were attached in most cases a limited number of students, generally those who had not yet taken a degree, called scholars, for whose maintenance funds were also appropriated. These bodies, consisting of a head, fellows, and scholars, were called colleges. They were legally incorporated, their powers being vested in the head and fellows. At first the privileges of the college were restricted to the persons constituting the corporation and maintained by its funds. Gradually other students were admitted, who paid for board and lodgings in the college building. These paying students were called "commoners," because they took their " commons " or meals in the college; and two classes were recognized, called "gentleman commoners" and "commoners" simply, the former dining at a separate table and enjoying some special privileges in consideration of higher pay. The distinction has now become nearly obsolete. In discipline and instruction there is no distinction between scholars and commoners. Thus the colleges became endowed institutions for the academical instruction of all persons able to pay for it. As their number increased that of the halls, which were mostly dependent on the students for support, declined. About 1570 the earl of Leicester, then chancellor of the university, obtained for himself and successors in office the right of appointing the heads of all halls which should thereafter be established; and by refusing to appoint a head, the chancellors prevented the opening of any new hall from that time till 1855. Gradually the whole business of instruction fell into the hands of the colleges and remaining halls. The only way of entering the university was to be admitted to one of these, and such admission and the payment of the required fees constituted a person a member of the university. But the university only, in its independent corporate capacity, could confer degrees. All members of colleges who receive stipends from the corporate revenues are said to be "on the foundation." At All Souls there are no scholars; at Keble there are no fellows or scholars; at Merton the scholars are called post masters; at Magdalen, demies (in Latin semi-socii); at Christ Church the fellows are called senior students, the scholars junior students. 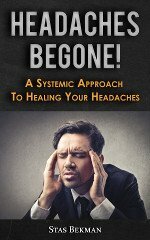 The head and fellows are in most cases the governing body. Discipline is exercised by the head and certain officers appointed by the fellows. The dean of Christ Church is appointed by the crown, the provost of Worcester by the chancellor of the university, the warden of Keble by the council of that college, and all other heads by the fellows. The head generally holds his office for life. Fellows and scholars are mostly elected by heads, and fellows after a competitive examination. Fellowships are tenable for life, but are vacated by marriage, ecclesiastical preferment, or accession to a certain amount of property. Scholarships are generally tenable for five years, and the stipends average about £80. There is also a large class of beneficiary students who are called exhibitioners, and the places they hold exhibitions, the right of nomination to which is vested in some institution of learning. The difference between them and scholarships is merely technical. The exhibitioners all receive stipends varying in amount from £25 to over £100. The university comprises 20 colleges, as follows: University college, founded by William of Durham in 1249; Balliol, by John Balliol and Devorgilla his wife, between 12(53 and 1268; Merton, by Walter de Merton, bishop of Rochester, at Maiden in 1204, removed to Oxford before 1274; Exeter, by Walter de Stapleton, bishop of Exeter, in 1314; Oriel, by Edward II. in 1326; Queen's, by Robert Eglesfield, chaplain to Philippa, queen of Edward III., in 1340; New, by William of Wykeham, bishop of Winchester, in 1380; Lincoln, by Richard Fleming, bishop of Lincoln in 1427; All Souls, by Henry Chichele, archbishop of Canterbury, in 1437; Magdalen by William of Waynflete, lord chancellor, in 1456; Brasenose, by William Smith, bishop of Lincoln, in 1509; Corpus Christi, by Richard Fox, bishop of Winchester, in 1516; Christ Church, by Henry VIII., in 1546-'7; Trinity, by Sir Thomas Pope, in 1554; St. John's, by Sir Thomas White, in 1555; Jesus, by Queen Elizabeth, in 1571; Wadham, by Nicholas Wadham, in 1613; Pembroke, by James I., at the expense of Thomas Tesdale and Richard Wight wick, in 1620; Worcester, by Sir Thomas Cookes, in 1714; Keble, by subscription as a memorial to the Rev. John Keble, in 1870. According to tradition, University college represents a school founded by King Alfred in 872, and in 1872 it celebrated its millennial anniversary. Balliol admits no one who claims any privilege on account of rank or wealth; its standard of scholarship is perhaps the highest at Oxford. New is intimately connected with the preparatory school and college at Winchester. Lincoln has no undergraduates, admitting only those who have received the degree of B. A. Christ Church is a cathedral establishment as well as a college. In the extent and magnificence of its buildings, the munificence of its endowments, and the number of its members, it surpasses all others at Oxford. In the tower over its principal gateway is the famous bell called Great Tom of Oxford, weighing 17,000 lbs. There are five academical halls remaining, the heads of which are called principals. They are unincorporated, and consequently property designed for their benefit must be held in trust by the university or some other trustee. In this way a few scholarships and exhibitions have been founded, and provision made for the principals in some of them. With these exceptions they have no endowments. In discipline, instruction, attainment of degrees, and university privileges, there is no distinction between students in halls and colleges. The halls are as follows: 1. St. Mary, given to Oriel college by Edward II., and made a separate school by that society in 1333; it subsequently became independent. 2. 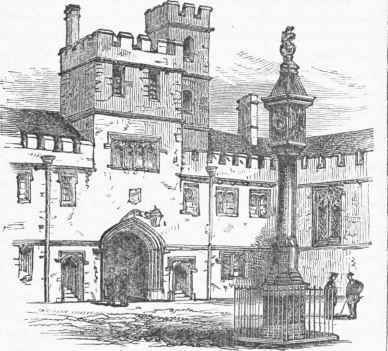 Magdalen, which became independent in 1602. In 1816 parliament authorized Magdalen college to prepare Hertford college, which had lapsed to the crown, for the reception of the principal and members of Magdalen hall, and to resume possession of the old hall and site; this was accomplished in 1822. A bill is now (1875) before parliament to make it a college under the name of Hertford. 3. New Inn, conveyed to New college in 1392, rebuilt in 1460. 4. St. Alban, founded as an ecclesiastical establishment in 1230; it came into the possession of Merton college in the 16th century, and was subsequently made independent. 5. 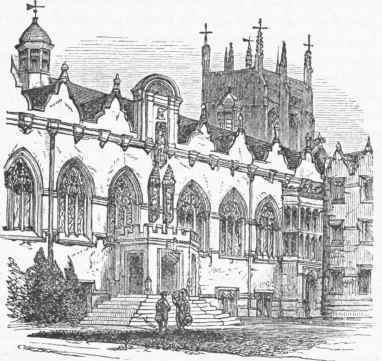 St. Edmund, which came into the possession of Queen's college in 1557, with which it still has some connection, its students being admitted to the lectures of Queen's. A statute passed in 1855 enacts that any member of convocation above the age of 28 may on certain conditions obtain from the vice chancellor a license, with the title of "licensed master," to open a suitable building as a private hall for university students. There is no distinction between them and other students as to discipline and privileges. Only one such, called Charsley's hall, exists. In 1868 persons were first permitted under certain conditions to become students and members of the university without being attached to any college or hall. Such students (called non ascripti) reside in the town and have all the rights and privileges of other students. They are under the general superintendence of a board styled "delegates of students not attached to any college or hall," consisting of the vice chancellor and four members of convocation nominated by him and the proctors. Two of these, styled censors, have the immediate charge of the conduct and studies of the unattached students. The colleges and halls examine applicants for admission previous to matriculation, but the examination is generally not at all difficult. A student whose name has been inscribed on the books of a college or hall, or of the delegates of the unattached students, and has paid the necessary fees, is a member of the univer-sitv. No university examination is required. The academic year is divided into four terms. Michaelmas term extends from Oct. 10 to Dec. 17; Hilary or Lent term, from Jan. 14 to the day before Palm Sunday; Easter term, from the Wednesday after Easter day to the Friday before Whitsunday; Trinity or Act term, from the day before Whitsunday to the Saturday after the first Tuesday in July, but may be continued by congregation. There is no vacation between the last two terms. - To obtain the degree of B. A. it is necessary to pass three distinct examinations. The examiners are appointed by the university. The examinations are partly in writing and partly viva voce. The first examination, called responsions, or in the language of the students the little go, is conducted by the "masters of the schools," six in number, who are nominated yearly in convocation. Responsions are held three times a year. Every candidate is examined in Latin and Greek grammar, Latin prose composition, one Latin and one Greek author, arithmetic, and either Euclid or algebra. A considerable range of choice is allowed to the candidate in regard to the authors in which he wishes to be examined. Every candidate who passes responsions satisfactorily receives a certificate called a testamur. A candidate who fails to pass the examination is said to be "plucked." Having passed responsions, the student chooses whether he will try for a " pass" or a " class;" that is, whether he will simply try to get his degree of B. A., or will also try for honors. If he "reads for honors," he will find it necessary to employ a private tutor. The second examination, called the first public examination, is held twice a year. It is conducted by ten moderators, and is called moderations. Candidates for a pass must offer portions of at least three Greek and Latin authors of the best age (two Greek and one Latin or two Latin and one Greek), one at least being a portion of a historical or philosophical work, and either logic or the elements of geometry and algebra. Candidates for honors in mathematics are examined in every branch from algebra up to the integration of differential expressions and the elements of the calculus of finite differences. Conic sections and geometry of three dimensions must be treated both geometrically and analytically. The second public examination, if passed successfully, entitles the candidate to his degree. It is held twice a year, and is conducted by 22 public examiners, divided into six schools. No student can offer himself for examination in classics before his 12th term, unless his 11th happens to be Easter, in which case he may offer himself in that term. Except in certain cases, he cannot be a candidate for honors after his 16th term. For candidates for a pass merely, this examination is comparatively easy, but for honors it takes a very wide range. Candidates for honors are examined in chronology, geography, and antiquities, and they may be called upon to compose in Latin, Greek, and English. Logic is indispensable with candidates for the highest honors. In mathematics it may be said that it is as severe as the examiners know how to make it. It embraces every branch of pure mathematics from algebra to the calculus of variations, and in mixed mathematics mechanics, optics, and astronomy. After the examinations for honors the successful candidates in each school are arranged in four classes, and the names in each class are arranged alphabetically and published. To be named in the first class is the highest honor. Peers, sons of peers, and certain others of the nobility, are by statute entitled to certain advantages over other students; but these are always waived, and in some colleges a refusal to waive them would be considered sufficient ground for denying admission. To obtain the degree of B. A. at Oxford is perhaps quite as easy as at most of our American colleges; to obtain the honor of a "first class" is extremely difficult. - The total amount of college and university fees payable by each student from matriculation to graduation is about £65. The expense of living for an economical student is about £250 a year, or £300 if he employs a private tutor. The number of "members on the books" in 1873-'4 was 8,532, and of. undergraduates 2,392. The number of the latter in actual attendance cannot be exactly ascertained, but was probably about 2,000. The number of matriculations in 1872, the last year reported, was 632, and of degrees of B. A. conferred, 396. Previous to the year 1874 no authentic information in regard to the aggregate revenue and expenditure of the university colleges and halls was accessible to the public. In 1872 a royal commission was appointed " to inquire into the property and income of the universities of Oxford and Cambridge, and of the colleges and halls therein," etc. The report of the commission, published in 1874, exhibits the condition of affairs as it existed in 1871, and it has not since been essentially changed. Besides its copyholds of inheritance, the university of Oxford owns 7,683 acres of land, and the colleges and halls 184,764 acres, situated in different parts of England and Wales. 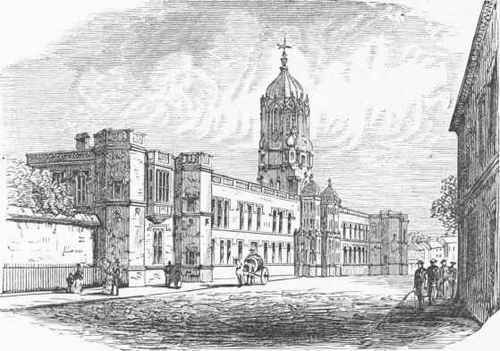 The total income of the university proper in 1871 was £47,589, and of the colleges and halls £366,254; total, £413,843. The sources of this income were as follows: from lands, £183,074; from houses, £29,996; from tithe and other rent charges, £39,609; from stocks, shares, etc, £37,201; from other property, £15,070; and from members of the university, £110,893. This income was expended as follows: payments to heads of colleges, £30,544; to professors, £13,500; to fellows, £101,171; to scholars and exhibitioners, £26,-226; all other expenditures, £242,402. Besides the revenues above mentioned, the university, colleges, and halls have in their gift 444 benefices, with an income of £188,695. Christ Church College, West Front.